Spatiotemporal objects i.e., objects which change their position and/or extent over time, appear in many applications. This paper addresses the problem of indexing large volumes of such data. We consider general object movements and extent changes. We further concentrate on “snapshot” as well as small “interval” historical queries on the gathered data. The obvious approach that approximates spatiotemporal objects with MBRs and uses a traditional multidimensional access method to index them is inefficient. Objects that “live” for long time intervals have large MBRs which introduce a lot of empty space. 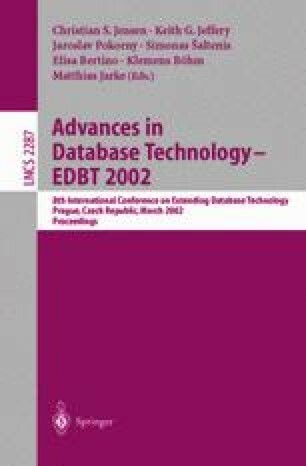 Clustering long intervals has been dealt in temporal databases by the use of partially persistent indices. What differentiates this problem from traditional temporal indexing is that objects are allowed to move/change during their lifetime. Better methods are thus needed to approximate general spatiotemporal objects. One obvious solution is to introduce artificial splits: the lifetime of a long-lived object is split into smaller consecutive pieces. This decreases the empty space but increases the number of indexed MBRs. We first introduce two algorithms for splitting a given spatiotemporal object. Then, given an upper bound on the total number of possible splits, we present three algorithms that decide how the splits should be distributed among the objects so that the total empty space is minimized. This work was partially supported by NSF grants IIS-9907477, EIA-9983445, and the Department of Defense.